Every rider knows just how crucial gloves are to riding – if you fall off, they’re likely to be the first thing that touches the ground – and we need to know our gloves can take the punishment. Since April 2018 gloves for motorcyclists are considered to be Personal Protective Equipment (PPE) and by law all new models introduced to the market have to pass a CE safety test. If your gloves have the CE label inside, here’s our guide to how to read it – and how the gloves are tested. The designation number shows the recognised standard the glove has been tested to – in this instance EN 13594:2015. Within the CE standard there are six mandatory elements that a glove must go through to achieve a rating, and one optional test for gloves if they’re to meet the higher standard. The first involves measuring from the glove’s wrist line to the end of the cuff – a Level 1 pass requires this figure to be at least 15mm, while Level 2 demands a minimum length of 50mm. This tests that a glove’s restraint (usually a Velcro strap) would keep the glove on your hand in the event of an accident. The glove is placed on a dummy wrist – a cylindrical base with a mushroom-shaped top – with the rounded top going inside the glove. One end of a clamp is attached to index and pinky fingers, while the other end is attached to the base of the cylinder. The clamps are pulled away from each other, to try and pull the glove off the dummy hand. For a Level 1 test they’re pulled apart with 27 Newtons (N) of force, while for Level 2 it’s 52N. For both levels the gloves need to stay firmly on the dummy hand for 30 seconds to pass. Three different parts of the glove are tested for resistance to tearing forces – the palm and the sides of the fingers on the palm side, the cuff and the back of the glove (including the back side of the fingers) and the fourchettes (the fancy name for the bits of the glove that sit in between your fingers). To test samples, they’re clamped into the jaws of a tensile tester. The jaws are separated at a constant force to check the material holds up to the strain. For a basic Level 1 pass, the palm and palm side of the fingers must withstand 25 N of force, the cuff, back of the hand and the back side of the fingers must survive 18 N, and the fourchettes must also hold up at 18 N of force. For the more advanced Level 2, the palm/palm side of fingers should withstand 35 N, the cuff, back of the hand and sides of the fingers should withstand 30 N, and the fourchettes should hold up at 25 N of force. The test for the strength of the glove’s seams is similar to the test for tear strength. A sample of the glove is clamped into two jaws of a tensile tester, with the seam in the middle and the edges of the sample hanging down off the sides of the tester. The machine pulls the two jaws away from each other and the force applied at the time the seam breaks is recorded. This is repeated three times for each seam on the glove. The seam strength is calculated by dividing the recorded force at the time of failure by the length of the seam. To meet Level 1, the main seams (which hold the glove together) need to survive 6 Newtons per millimeter (N/mm), and the fourchettes 4 N/mm. For a Level 2 rating, the main seams must survive 10 N/mm of force, and the fourchettes 7 N/mm. Arguably the most important test of all, the abrasion resistance test sees how the gloves will hold up if they hit the road. A sample of the glove is attached to a holder and dropped from a pre-determined height onto a moving belt of abrasive material. Testers record the time it takes to make a hole in the material – a test that’s repeated across four samples. To achieve a Level 1 rating each sample must last at least three seconds before holing and the mean average time across all four samples can’t be less than four seconds. To receive the higher Level 2, the single time can’t be less than six seconds, with the mean average at eight seconds or more. The test for impact attenuation is optional for gloves aiming to be certified at Level 1, but compulsory for gloves submitted for Level 2 testing. A sample of the glove is placed on the dome of an anvil, and a 2.5kg striker hits the sample with 5 joules (J) of force. The force transmitted through the protector is recorded. The test is carried out four times. To receive a Level 1 rating, a single strike cannot transmit more than 9 kilonewtons (kN) and the mean force over all four samples can’t exceed 7 kN. For a Level 2 glove, the single force can’t be more than 4 kN, and the mean must stay below 4 kN. Samples are inspected after each test and if there are any tears or holes in the surrounding leather it is considered an immediate fail. In 2017 the French government made it compulsory for motorcyclists to wear CE-approved riding gloves on their roads. 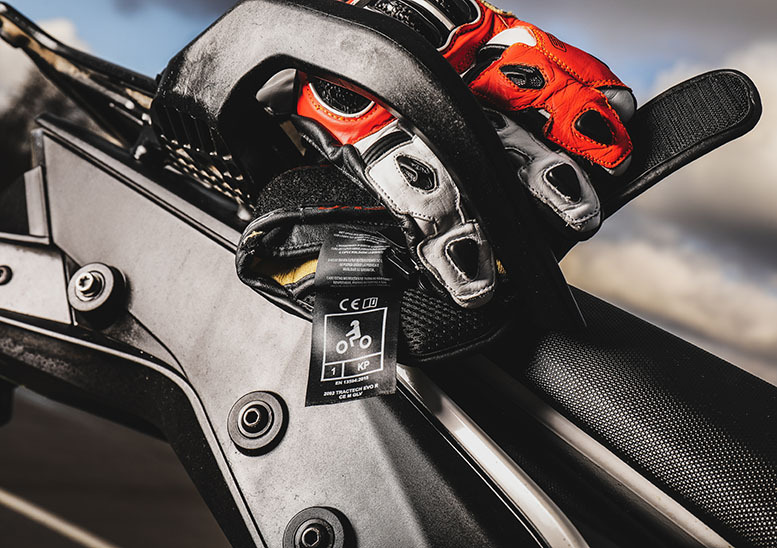 In theory that empowers the police to carry out roadside checks to ensure all riders have the CE label inside their gloves (complete with the pictogram of a motorcyclist). Those that don’t have the label face a €68 fine (speedy payers only cough up €45). In reality, we’d expect riders wearing gloves that are clearly designed for motorcycling to be left well alone. However, those who are stopped for other offences, such as speeding or dodgy overtaking, might find their failure to wear CE-approved gloves is added to their list of offences. If you want to know how clothing is tested to CE standard, see our detailed guide here; we’ve also gone into detail on motorcycle boots and the standard for protective body armour.